Follow Me.The Big Rock - Follow Me. My seminary classmates and I were told by a certain theology professor, “If you get up to the ambo on Trinity Sunday for your homily, and all you say is, ‘The Trinity is a mystery so we can’t explain it,’ I will come and hunt you down.” So far I haven’t been brave enough to test his threat. We begin with ourselves. Such a phrase as “my nature” suggests that there is a person, I, who possesses a nature. The person could not exist without his nature, but there is some distinction all the same; for it is the person who possesses the nature and not the other way round. The one infinite nature is totally possessed by three distinct persons. Here we must be quite accurate: the three persons are distinct, but not separate; and they do not share the divine nature, but each possesses it totally. God is a communion of persons, but this communion isn’t between three separate people, like a father, mother, and child. Each of the persons is fully God, and there is only one God (one divine nature). This is a small but significant first step in understanding who God is. It should lead us to awe, wonder, and reverence. It should instill in us a deeper desire to worship the Blessed Trinity and to enter into the mystery so deeply that we are wholly enveloped, and “lost” in it for all of eternity. It should kindle the fire of love and desire for deeper communion in our weak little hearts, which were created by this awesome mystery. Flowing from this love, we can see how an an intimate knowledge of our Trinitarian God can change our lives and reorient our priorities in practical ways. Above the pinnacle of all creation, at the very ground of Being itself, we discover that the Source and Summit of all things isn’t a single, monolithic being. It is a Trinity of persons in one Godhead. The “I” that so often dominates our thoughts, actions, is incomplete. There is no singular king of the mountain, and the zero-sum principle that often guides our life is false. Reality has its deepest foundation and its highest peak in a “we:” the Most Holy Trinity. This is the greatest revolution in thought and action that the world has seen. No longer is it simply survival of the fittest. No longer is the “other” a threat. Your “you” won’t cancel out my “I,” but bring it to its fulfillment. In his Book, First Things First, Stephen R. Covey described his “Time Management Grid” as a way of separating life’s tasks into four categories: Important and Urgent, Important but not Urgent, Not Important but Urgent, and Neither Important nor Urgent. 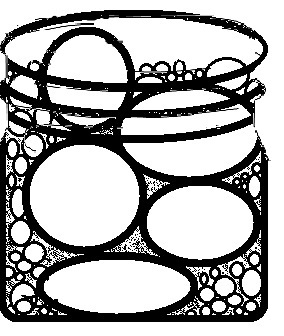 He also described the classic image of a jar with large stones, pebbles, sand and water. If you put the items into the jar in that order, they can all fit. But if you try to put the pebbles, sand, or water in before the large stones, then you’ll never fit the large stones in. The tasks that are “Important but not Urgent” are the large stones of our lives: preventing burnout or health problems, increasing production, building relationships, etc. These things don’t press on us and urge us to react to them. They sit idly by in life, like big stones, waiting for us to pick them up and put them in their proper place. Often they are overlooked for the smaller, more easily moveable sands and pebbles of busywork, crises, entertainment, and routine maintenance. As Christians, we don’t ignore these smaller things, but we do put them in their place. “Seek first the kingdom [of God] and his righteousness, and all these things will be given you besides” (Matthew 6:33). “You are anxious and worried about many things. There is need of only one thing” (Luke 10:41-42). Our big rocks, the the two great commandments of Jesus, are our relationship with God, and with our neighbor (Matthew 10:36-40). We are called to communion with the Trinity, and this is the only way to have perfect joy. But the “we” of the Trinity is manifested to us through the icons of the family, the Church, and intentional friendships. If relationships don’t form the bedrock of our lives, then we aren’t really living as Trinitarian people. If I don’t consciously invest myself in spending time with other people, building them up, listening to them, relying on them, and sharing divine life with them, then I’m living as if the Trinity didn’t exist. Relationships with others come second to our relationship with God. But, considering the infinite number of things we could be doing, second is pretty high up on the ladder. The “you” of the other person – their physical, emotional, and spiritual well-being – is the only way that my “I” can fully develop into itself. So whether a person is called to family, religious life, or priesthood, we find that our deepest foundation is intentional communion. In this way, I begin to take hold of the greatest mystery of our faith, not simply with my intellect, but through imitation and grace. The Trinity isn’t a speculative thought tucked away in a theology book. The Trinity is life itself, and the source of all life. And we are destined for communion with this great and inexpressible mystery. So let’s start living that way.